METRO rubber is made from an advanced, proprietary EPDM formula which has superior ozone and UV resistance. METRO's rubber products are molded using high heat and 40-to-125 tons of pressure, which gives them a longer life and clean, smooth looks. METRO's parts quality, and look and feel usually surpasses the quality of the original rubber parts. All the fine details of the original parts are precisely duplicated, even the details that won't show after installation. The most advanced materials combined with the latest technologies make METRO rubber the highest quality rubber parts available. METRO's SUPERSoft sponge rubber is the softest and most durable auto rubber you can buy. SUPERsoft has a unique closed micro-cell structure. This cell structure helps give SUPERsoft its superior softness. The material formula and secret manufacturing process gives SUPERsoft better shape "memory", better looks, and better durability and resistance to abrasion, tearing and ripping. Unlike other auto weatherstripping, SUPERsoft does not absorb water -- a key condition to completely sealing out water. Installation Tips - Please Read Before Installing! Your auto restoration plans are coming along and you're ready to install the finishing touches with the best rubber weatherstripping from METRO. Here are a few simple tools, tips and techniques that will give your project a real professional finish. Be sure to read through this section and gather all the materials you will need prior to starting the job. Apply a water-based lubricant/protectant such as Armorall, or a silicone based furniture polish like Lemon Pledge, to METRO parts where noted in the instructions. Among other things, these lubricants/protectants will allow you to more easily slide fitted rubber parts into cavities or channels. Always use a clean rag to apply these products. METRO's SUPERSoft rubber is designed for long life and superior sealing qualities. To assure that your installation takes best advantage of these products, we suggest you use the 3M Super Black Weatherstrip Adhesive # 08008. Always keep in mind, this adhesive dries quickly, so have the surface area and replacement part fitted and ready for installation prior to adding any glue. Always apply the glue to another object like a popsicle stick and use the stick to carefully apply the glue to the rubber. For removing old rubber and any remaining adhesive residue, try the 3M Weatherstrip Adhesive Release Agent # 8971. Cover any adjoining finished auto body surfaces prior to application with masking tape. This is especially important when applying glue. Simple tools are needed for the installation, such as a Phillips head screwdriver, pliers, and a sharp knife or razor blade. Masking tape will protect your car's finish when removing or installing rubber. A color crayon may be used to match and mark the anchor holes. A clean spackling tool or scraper can be used for spreading glue and inserting the rubber into channels by using the edge. * Super glues can be used to repair rubber if it tears during installation. * We recommend 60-grit sandpaper to lightly roughen the rubber surface that will bond next to your car so that your rubber adheres better when using an adhesive. * Use a clean rag to wipe and dry your car surface prior to applying your weatherstripping. Check carefully to make sure all clips are lined up with the proper holes before inserting ANY clips in door holes. If the clips are removed or improperly lined up, the rubber may be torn. Remove the old strip in one piece if possible. Remove any old anchor plugs using a pliers. Pushing and poping through any broken pins will also work. Clean the entire door surface and repair any rust spots first. On hardtops and convertibles, your strip is made to fit exactly. On sedans and trucks, where lengths of extrusion are used, carefully cut the ends squarely to match together, allowing a 1/4 inch to overlap. 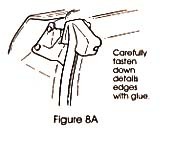 At this seam, apply adhesive to the ends of the strip. Hold the ends together a moment and add a small amount of glue around the edges to get any areas missed. Then allow the seam to fully dry before shutting the door, checking for any oozing glue. Check your door for alignment. 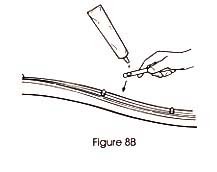 Your SUPERSoft weatherstrip is made to the correct factory specifications. SUPERsoft sponge rubber will adjust to irregularities in doors for a postive seal and ease of closing doors in about a week. We have been in business since 1991 selling quality weather stripping for 1930s-present cars, trucks, and vans. We also sell car and truck accessories, clips and fasteners, nuts and bolts, and so much more. and we will be glad to try and help you find the parts you need. Auto & Truck Specialties aka The Clip House is happy to ship international(world wide), feel free to contact us by clicking on the 'Ask A Question' link on this listing or call 1-800-373-3870 or 719-636-1765 before buying to get a shipping cost. International Buyers – Please Note: Import duties, taxes, and charges are not included in the item price or shipping cost. These charges are the buyer's responsibility. Please check with your country's customs office to determine what these additional costs will be prior to bidding or buying.